» What Superheroes can tell us about Economics - Why Study Economics? 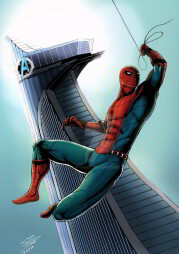 The world of superheroes is clearly and unambiguously fantasy. We aren’t going to look out the window and see a caped marvel flying alongside our plane at 30,000 feet, or discover an island populated by women imbued with powers from Greek gods, or be surprised by a teenager crawling up the side of Big Ben. Nevertheless, there has to be a fiber of reality in the story, something for readers (and viewers) to connect to. Something that keeps the imagination tethered just enough to think that the hero can relate to you, and that you could be the next hero. It just so happens that the thread which connects superhero tales to something we actually can believe is a set of economic forces beyond even the most over-powered hero’s control. Economics and superheroes may seem like strange bedfellows. Economics is complex, mathematical, and truth be told, a little grisly. Superhero stories are escapism. The juxtaposition of applying comparative advantage to The Avengers or making Superman the poster child for the role of institutions in facilitating economic growth may stretch people’s thinking, but no more so than the tales of superhero derring-do themselves, or for that matter, the belief that economic forecasts will actually come true. Freakonomics used economics to explain oddities like why drug dealers live with their mothers and why sumo wrestlers cheat. Those same tools can provide insight into why most heroes need day jobs, why Batman hires Robin, why criminals keep trying, why Superman doesn’t take over the world, and yes, why the Caped Crusader is battling the Last Son of Krypton. In fact, applying economic logic to the behavior of superheroes is probably a far better use of economics than trying to read the tea-leaves. If economists can explain the behavior of fictional heroes, maybe we can start to better understand what motivates people in the real world. And that would really be amazing. 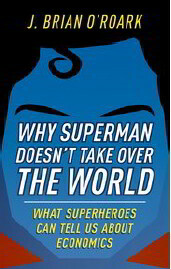 Professor O’Roark is the author of Why Superman Doesn’t Take Over the World: What Superheroes can tell us about Economics. Oxford University Press, 2019. « Previous post: Is it worth going to university? This entry was posted on Friday, March 22nd, 2019 at 2:26 pm	and is filed under Economic thinking. You can follow any responses to this entry through the RSS 2.0 feed. You can leave a response, or trackback from your own site.